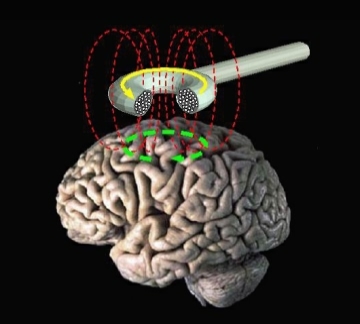 TMS (Transcranial Magnetic Stimulation) is a painless, non invasive neurostimulation technique that applies high intensity magnetic impulses to cortex areas by placing a coil on the surface of the head. It is used as a research tool to gain knowledge of neurophysiological and cognitive mechanisms. There are many potential therapeutic applications, particularly in psychiatry and neurology: TMS is currently under clinical evaluation in diseases like drug-resistant major depression and chronic neuropathic pain. Transcranial magnetic stimulation by Eric Wassermann, M.D. Transcranial Brain Stimulation. Behavioral Neurology Unit, National Institute of Neurological Disorders and Stroke. Simone Rossi, Mark Hallett, Paolo M. Rossini, Alvaro Pascual-Leone and The Safety of TMS Consensus Group, Safety, ethical considerations, and application guidelines for the use of transcranial magnetic stimulation in clinical practice and research, Clinical Neurophysiology 120 (2009), pp. 2008–2039 [Read more]. JP Lefaucheur et al., French guidelines on the use of repetitive transcranial magnetic stimulation (rTMS): Safety and therapeutic indications, Clinical Neurophysiology 41 (2011), pp. 221-295 [Read more]. JP Lefaucheur et al., Evidence-based guidelines on the therapeutic use of repetitive transcranial magnetic stimulation (rTMS), Clinical Neurophysiology (in press, 2014) [Read more].